An irresistible adventure fantasy about Nim – a young girl alone on a tropical island except for her three amazing friends: an iguana, a sea-lion and a turtle. When a hurricane strikes, Nim becomes a hero in a single-handed sea rescue. Now a major feature film starring Jodie Foster, Abigail Breslin (‘Little Miss Sunshine’) and Gerard Butler (‘300’). Nim lives on an island in the middle of the wide blue sea with her father, Jack, a marine iguana called Fred, a sea lion called Selkie, a turtle called Chica and a satellite dish for her e-mail. No one else in the world lives quite like Nim, and she wouldn’t swap places with anyone. But when Jack disappears in his sailing boat, and disaster threatens her home, Nim must be braver than she’s ever been before. And she needs help from her friends, old and new. Named one of the Best Books for Children of 2001 by the L.A. Times. Nim and her dad live all alone on their island. Do you think this would be a fun way to live? What might be some of the problems? Think of all the different things you could make out of coconuts if you lived on an island like Nim’s. What else could you make out of things you could find on the island? Could a whale really have swallowed Nim’s mother? What do you think happened? Would you like to have Nim as a friend? What could you learn from her? What could she learn from you? Alex Rover does all her research from her apartment. What are the good and bad things about learning this way? What would you name Nim and Jack’s island? What about their boat? What do you think Nim’s mum’s name might have been? Where do you think Alex Rover lives? Are there clues in the book? Nim’s Island has been made into a movie. Does this change how you think Nim looks? What about the hut? The island? Why do you think the animals may be different? A book and a film tell a story in different ways. Divide into groups and have a debate about which way you like best and why. Write a letter describing where you live to someone who lives on a small island and has never seen a home like yours. Write a journal as if you were Jack while he is on his boat and trying to get back to the island. Look at a globe. Where do you think Nim’s Island might be? Are there clues in the book? Marine iguanas – how are they different from other iguanas and lizards? Where do they live? Find out more about the Galapagos Islands. If they are only supposed to live on the Galapagos Islands, why might they also live on Nim’s Island? Sea lions – how are sea lions different from dolphins? Find out more about sea mammals. Sea turtles – how are they different from land turtles? Can they retract (pull in) their head and flippers? If not, can you guess why it wouldn’t be as useful for them as land turtles? How long do they live? Coconut pearls – are they real? How many coconuts might you have to open to find one? Volcanoes – what happens when a volcano erupts? Where might you see a real volcano like the one on Nim’s Island? How hot would it be inside? Time zones – why is it a different time of day for Alex and Nim, even if they are writing at exactly the same moment? Nim’s Island was inspired partly by two letters from girls asking me to write a book about them. I said that I couldn’t do that, but I started playing the writer’s game of “What if?” (two very important words in finding stories). “What if a girl wrote to an author and said “Could you please write a book about me?” and the author said, “No, because I’m a very famous writer who writes very exciting books, and since you’re just a little girl your life would be much too boring.” But what if the girl’s life was more exciting than the author’s? I then decided that the girl’s life was more exciting because she lived on an island, and write the book all in letters between the girl and the author – which was very boring. 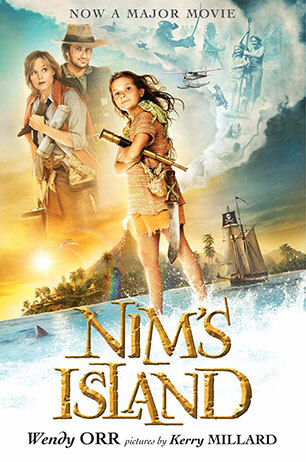 Finally I remembered a story I’d written when I was 9, about a little girl running away from an orphanage to life alone on an island – and finally Nim’s Island came to life. So the inspiration was partly those letters, but the deeper inspiration was seeing a tiny little island when I was 9 and thinking that I’d like to live on it, because that’s why I wrote that first story. Did you draw the map of the island? I drew a map while I was writing the story. I sent it to Kerry Millard, the illustrator, and she redrew it to look good. The original map is in the National Centre for Australian Children’s Literature at the University of Canberra, where my papers are stored. When Geoff Kelly illustrated the third book, Rescue on Nim’s Island, he drew a new map, and also drew a special colouring-in map, which you can download here. How did Nim’s Island become a film? 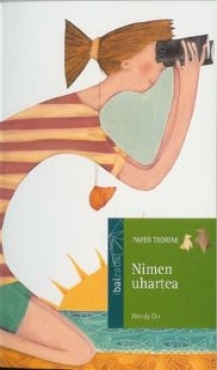 When the book came out in the US in 2000 it won or was shortlisted for quite a lot of awards, including the Los Angeles Times Best Books for 2001. That meant it went into most libraries in Los Angeles, and was on display in the Santa Monica public library when the film producer Paula Mazur went in to get a book for her 8 year old son for the summer holidays. She took it home and started reading it to him, found the whole family was drawn in, and asked me for the film rights. 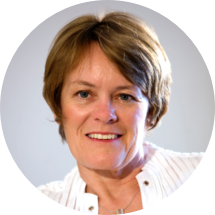 We worked on the pitch together; she pitched it to several Hollywood studios, had interest from 4, and went with Walden Media, who specialised in children and family films adapted from literature. Fox then became a partner for US and international distribution. Did you have any input into the movie? I was a consultant and worked on the first two drafts of the screenplay with Paula Mazur and the screenwriter Joe Kwong. The movie put a lot of emphasis on the author Alex Rover and her development throughout the story. Were you pleased with the script and its changes? I felt it represented my idea of Alex quite accurately, in a visual medium. Jodie Foster also happens to look very much like my conception of Alex! What it’s like to step into the pages of your own book, quite literally? However it was the sea lions that brought me undone: when I sat with my arm around Friday, one of the two sea lions playing Selkie, he was so real, solid and completely the personification of the Selkie who’d lived in my head for 14 years, that I couldn’t stop crying. The eeriest incident was walking through the set of Alex Rover’s home. It was one thing that differed dramatically from the book, and I’d argued a little about the reasons for it to be a highrise Manhattan apartment rather than a house in San Francisco. Then I walked through it… and felt creepily as if it was somewhere I’d once lived but had somehow forgotten. It was obviously absolutely perfect as her home. Is it true that you appear in the film? Where? What are your favourite island stories? As a child, I loved Treasure Island, Coral Island, The Swiss Family Robinson, Robinson Crusoe… and later Lord of the Flies, in a different way. Later I discovered The Island of the Blue Dolphins. Would you enjoy living on a remote island like Nim or are you more suited to civilization? Much as I love island life, or living in the country, I quite like being within reach of civilisation.